The Microsoft Deployment Toolkit alternative AOMEI Image Deploy can help you rapidly deploy system image to multiple computers or clone multiple computers over network. Microsoft Deployment Toolkit (MDT) is a deployment tool released from Microsoft. MDT takes computer imaging in a different direction. It is based on Windows Image File. 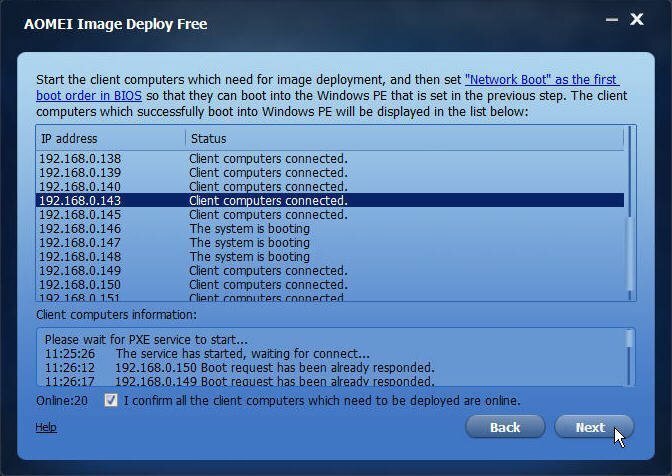 Windows users can use MDT to deploy operating system and applications, sysprep and capture image as WIM or VHD files, and then, deploy those images to computer with a boot ISO. However, when you use Microsoft Deploy Toolkit to deploy images, you may find it is complex to operate. Thus, many users try to find a Microsoft Deployment Toolkit alternative. Fortunately, there is an amazing Microsoft Deployment Toolkit alternative, AOMEI Image Deploy, which is a free image deployment and network cloning software, can rapidly deploy system image to multiple computers or clone multiple computers over network. Most of companies will install operating system to multiple computers. But installing OS on computer one by one will take a lot of time, which is annoyed. While, image deployment can solve the problem. 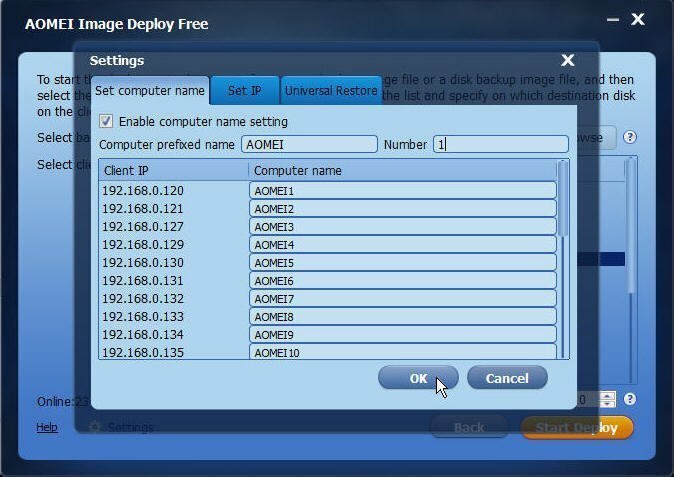 And AOMEI Image Deploy is such an image deployment software that offers a free solution to deploy your system image to multiple computers with in LAN. It can help you save time and resources by provisioning hundred of PCs and Servers simultaneously. What's more, this freeware supports all windows operating systems, including Windows 10/8.1/8/7/Vista/XP and Windows Server 2003/2008 (R2)/2011/2012 (R2)/2016. 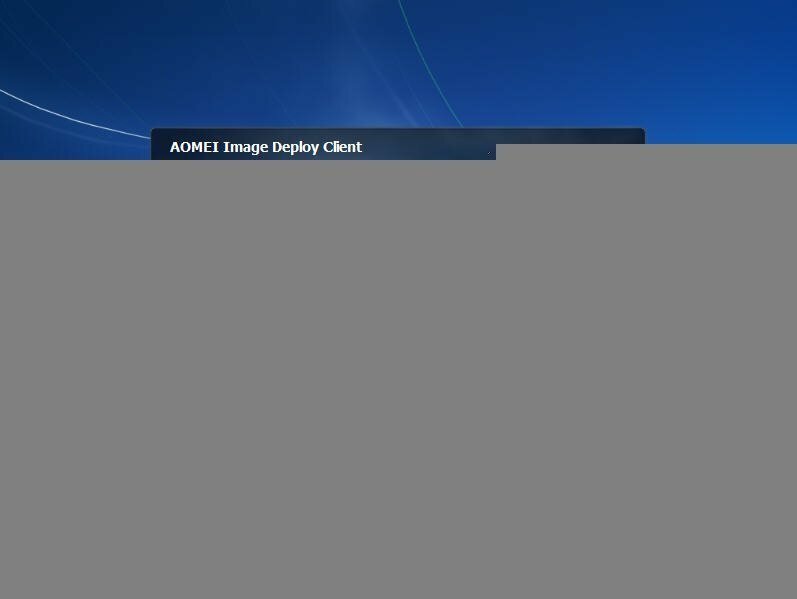 How to deploy Windows image with AOMEI Image Deploy? You must really want to know how to deploy Windows image with such a great software. Using AOMEI Image Deploy to deploy Windows image is easier than using MDT. It will guide you through step-by-step wizard. 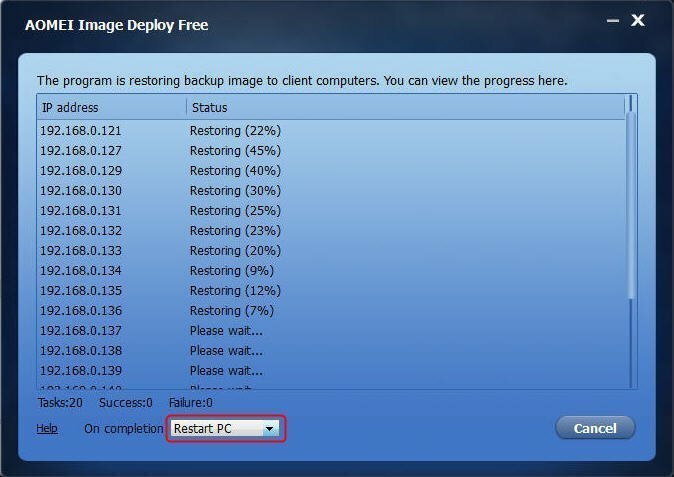 Its built-in universal restore technology allows users of any skill level to deploy image to multiple computers with identical or dissimilar hardware. Before you do, here you need to prepare for it. 1. You need to select a fully functioned machine which running Windows PC system or Server system as server computer. Then, make sure how many client computers that need to be deployed. Confirm that the server computer and client computers are on the same network segment of the same LAN. 2. Confirm that the network adapter in the client computer supports PXE boot. 3. 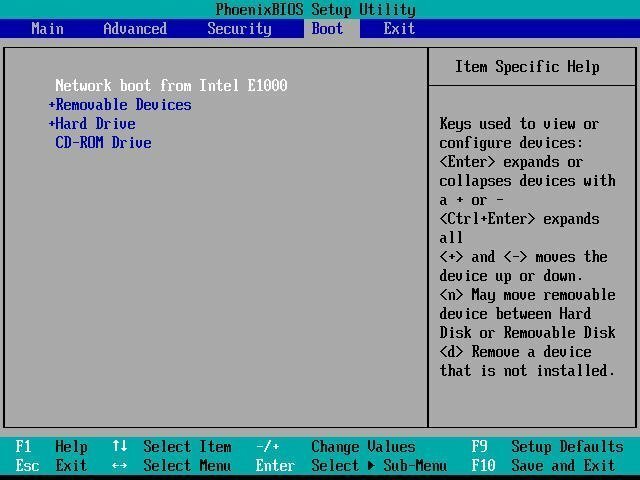 Start all client computers, enter into BIOS, set the network boot as the first boot device. 4. Please confirm that the sequence number of the destination disks for image deployment on client computers are same. You can also remove other disk on client computer to ensure that there is only one destination disk for image deployment. 5. Please confirm that the Windows Recovery Environment (Windows RE) in the server computer is complete. Otherwise, you need to download Windows AIK/ADK. If your OS is older than Windows 7, then you need to download it too. 6. Using AOMEI Backupper to create a full system image backup or disk image backup on a machine with the OS, applications, settings, and data you desired. 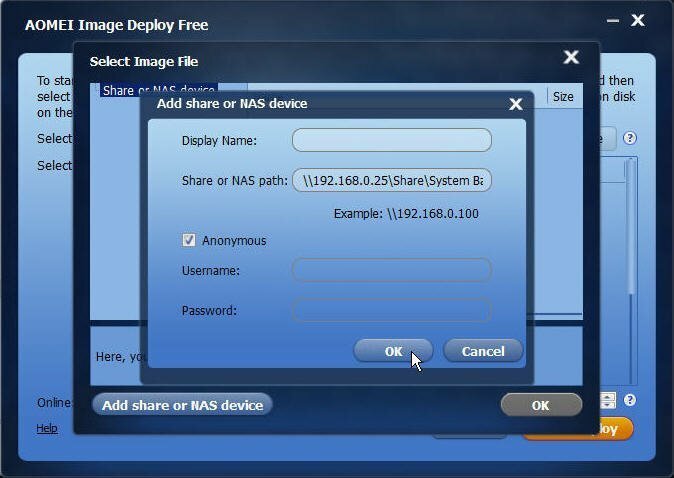 Save the image file to a NAS or network shared folder which is on the same network segment of the same LAN as the server computer. After preparing, you can start to deploy system image over network with AOMEI Image Deploy. Step1. Download AOMEI Image Deploy, install and launch it. 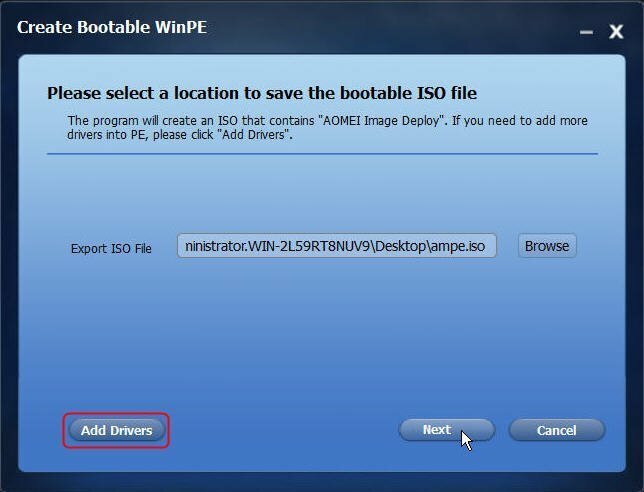 It will display you two ways to create a bootable WinPE ISO file. There may be a chance of drivers being incompatible with your hardware and the WinPE cannot start up the client computers. When you meet this problem, you should choose “Create bootable WinPE manually” so that you can add custom drivers into WinPE. Note: You should tick the checkbox “Enable DHCP” if there is no DHCP server in your LAN. At the same time, the booting progress of all client computers (defined via IP address) will display on AOMEI Image Deploy. Once one client computer has connected to the AOMEI Image Deploy service successfully, it will show “Client computers connected”, also will show you the local IP, server IP and connection status. When all client computers have connected to the AOMEI Image Deploy service, tick the checkbox of “I confirm all the client...” and click Next. Step3. Here you nee to choose the image you want to deploy and configure how to deploy Windows image to client computers. First, click Browseto select backup image file. 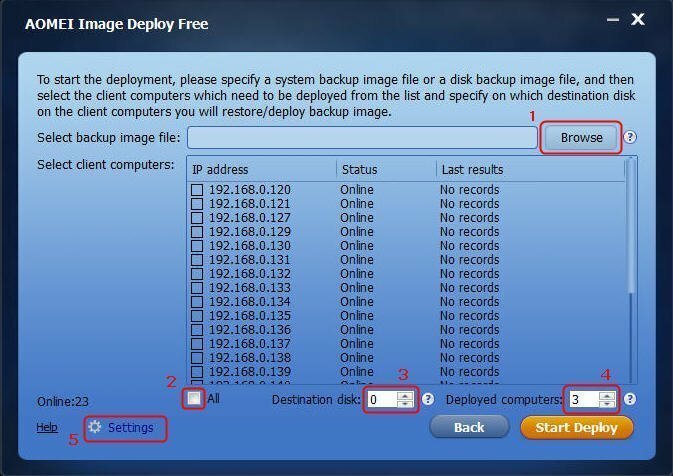 Then select the client computers on which to deploy the specified backup image, or you can tick the checkbox of “All”. Then, set up the sequence number of destination disk, and how many computers to deploy every time. ● Click “Browse” to find the system backup or disk backup image file you have prepared, and then, click “Add share or NAS device”. In the pop-up window, enter the network or NAS path where the image file is stored. 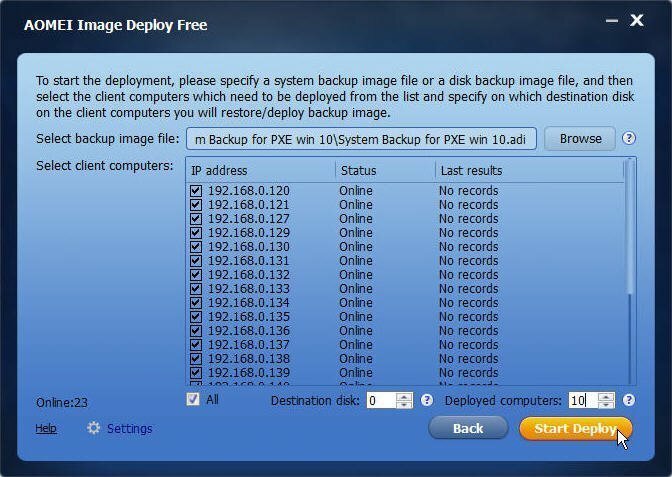 Select the image you are planning to deploy, click OK.
● You can also remove other disks,to keep one disk on the client computers only, so that you can ensure that the sequence number of destination disk in client computers are the same. ● Image deployment to a client computer may cause data on the destination disk loss. So you need to make sure that you are performing the deployment to the right computer and right destination disk on computer. ● We highly suggested you deploy 3 computers every time. The more computers you input, the slower the deployment speed will be. ● You can also click “Settings” to set up computer name, IP, and AOMEI Image Deploy enables you do “Universal Restore” if the hardware of client computer is different from the computer on which you create the image. Tips: IP preset and deploying image to computers with different hardware are only available in AOMEI Image Deploy Technician Edition. After selecting the image, and setting up all, you can click Start Deploy to deploy image to all client computers. Here takes deploying Windows 10 system image to 10 computers every time as an example. Then, you will move to the final page where you can view the image deployment progress of each client computer. You can also choose whether to shut down or restart the client computers after the deployment is completed. The AOMEI Image Deploy should be the best Microsoft Deployment Toolkit alternative. With this software, deploy Windows operating system image to multiple computers becomes an easy thing.